The Sons Of Liberty - Bradlee Dean: The Answer to America's Dilemma Resolved! 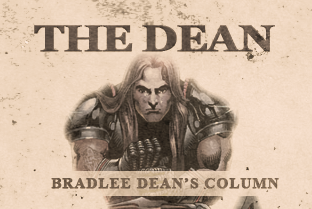 Home - The Dean-Bradlee Dean: The Answer to America's Dilemma Resolved! There are men and women in the thousands who have fought, bled and died to give us the freedoms we now possess. They are six feet underground. The truth of the matter is, these veterans fought, bled and died fighting against the ideologies the American people are tolerating through this current administration. If the American people were truly thankful for their freedoms, they would not tolerate crime in their representatives whatsoever (Article II, Section 4, of the U.S Constitution). Currently, we are out on tour in California doing television, radio, tea parties, etc. During my last tea-party event in Southern California, I noticed a reoccurring theme going throughout the speakers: what the left is doing, what the socialist are doing, what the Democrats are doing and what the immoral are doing (which by the way are all one in the same). And as usual, when I had the opportunity to do my best in setting the record straight, by using the Bible and our founding documents, I had to ask the audience: “How many Constitutions do we have?” They replied, “One!” I then said, “If there is one Constitution, then why are you complaining about what the left is doing? For if everyone here were doing the right thing all of the time, there would be no left to complain about!” Everyone seemed to agree. Friends, government’s purpose is to “ensure our rights,” rights God gave (Declaration of Independence), not to strip them away under another party name or party guise. What it really comes to is this: If you really knew the price paid for your freedoms (John 3:16), you would live to magnify the laws our veterans died to give us. “Justice is the guardian of Liberty” (2 Corinthians 3:17). We are not going to have liberty without justice (Isaiah 42:1-4). And until you know what the law says through our founding documents, and until you know what that law says in God’s Word (Exodus 20), you cannot bring forth judgment to establish righteousness, peace and resolve! “We the people” need to begin to magnify the law against all that would attempt to desecrate the sacrifice given (Romans 3:31). This is not going to happen until you see what was sacrificed on your behalf to give you what it is that you have. Herein lies the heart of the issue. Friends, God gave His Law because He loves, and we can see this through the sacrifice of Jesus Christ on the cross, which covered sin, through His blood, to establish His Law toward (maybe “against” would be a better word here) sin. If I am born of God, then I am, by His spirit (John 3:3, Romans 5:5), going to love what He loves and am going to hate what He hates. And I am not going to love my brothers and sisters the way that I should until I first love God with my whole heart, soul, mind and strength (1 John 5:2, Hebrews 1:8-9, Hebrews 10:16). And I am not going to love God until I see that He first loved me through His Son’s sacrifice (2 Corinthians 5:15, 1 John 4:19). Are you thankful for the sacrifice that has been given on your behalf, my friends? If you are, you can rest assured that you will not tolerate what offends God! And what offends God? That which put Christ on the cross. What put Christ on that cross? Sins men have committed! And what is sin? The transgression of Gods Law! And what did love do to cover man’s transgression? Love sacrificed by Christ fighting, bleeding and dying on Calvary to redeem men through His blood back unto the Father (John 15:13). So, if we as a people see the price paid for our freedoms, there will be no room to tolerate anything that would attempt to desecrate that which God gave through His Son Jesus Christ (in the Spiritual), or in what men have died to give us through their sacrifice (in the natural). Until America sees the price paid for their freedoms, they will not live for what men have died to give!